Are you new to Wizard101? Did you start playing Wizard101 after 2010? It was requested by @Scarlet735 on Twitter that I talk about a few features of the game back in the olden days, otherwise known as the first few years of Wizard101. I didn't join Wizard101 until mid-2009 but I joined right around the time when Wizard101 hit ONE MILLION PLAYERS. I decided to split this post up into different sections to talk about how Wizard101 was back in the old days. If you want a few old things, keep reading so you know how the game was back when I joined. I have a lot to talk about, so I'm going to split this up into a series of posts! I hope you enjoy them. Here is the Wizard101 Fansite/Blogs/Youtuber edition of Wiz Back In The Olden Days / when I first started the game! Diary of a Wizard was an amazing official Wizard101 Fansite owned by Fallon Deathblade and her husband, Valerian. The owners were great people that always attended events and talked to everyone on the game. They posted regularly on Facebook, their Website, and on their Forums. "The Ravenwood Ball & Birthday Bash" was an annual event that Diary of a Wizard hosted each year just for their Birthday. This event was actually similar to today's Fansite Fest. Diary of a Wizard celebrated their Birthday by having this large event for the community in Ravenwood. They had more prizes than you could possibly imagine! Blog Owners got together and contributed to the event by offering to use their houses for everyone to teleport to once the event started. 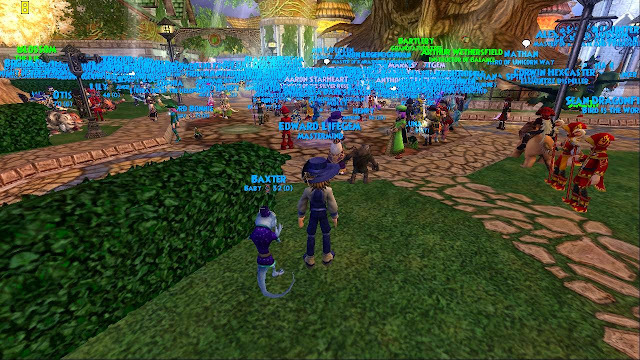 In Ravenwood, we'd have dance parties and take plenty of screenshots with the fansite owners. There were art/graphic contests too to help spread the word about the event! I really have to thank Diary of a Wizard for hosting events like this, because these events were what really introduced me to such a great community. Diary of a Wizard's First Ravenwood Ball & Birthday Bash was on May 29th, 2010. I attended this first event through the last one in 2012! I remember it like it was yesterday. This was such an amazing time for Wizard101! I want to thank Fallon and Valerian for their hard work for keeping the community together. Ravenwood Radio was another amazing fansite, now known as SpiralRadio101 that you can listen to on Wednesdays at 8:45 pm CST on Twitch! This amazing podcast was originally owned by Leala and Stephen Spiritcaller. (Shoutout to Fallon Deathslinger and Christina Icedreamer (now current cohost with Stephen of SpiralRadio101). Leala and Stephen talked local news on Wizard101, had special event livestreams, and amazing contests! I remember listening to the very first episode of Ravenwood Radio back in late 2009. I believe this was the first time I have ever heard of a game fansite. I don't remember how I found out about the first episode, but I do remember watching live! Talking about it is nostalgic. There are so many great memories from Ravenwood Radio, so I'll just talk about a lot of those memories. I remember attending special livestream events of Briskbreeze Tower (located in Colossus Boulevard), watching livestreams of many different dungeons such as the Malistaire DS dungeon, watching DITTO and Mrs Narrator's hilarious segments on each show, special guests (like The Friendly Necromancer aka Dworgyn aka our community manager Tom), etc. There were so many great memories from Ravenwood Radio. I had school, but I always took the time to finish up my homework to watch each show. AND after the show, they always had an afterparty in Nightside. We'd log into the game, run to Nightside, and visit with everyone including the amazing co-hosts. I wish I knew how to take screenshots back then because I would have taken 100... MILLION... screenshots! :D If you would like to see a video of the teleportation into Nightside after Ravenwood Radio, you can watch the video attached above! Thank you Leala, Fallon, Icy, and Stephen for so many great memories with Ravenwood Radio and the future with SpiralRadio101! The Friendly Necromancer was an official Wizard101 fansite owned by our now Community Manager, Tom Purdue. Many of you know this already, but "The Friendly Necromancer" was the reason I started blogging! Tom is known as the GRANDFATHER of Wizard101 Blogging! We were all so lucky to have such an amazing website. "The Friendly Necromancer" was created on September 20th, 2008. I started reading his website sometime in late 2009 after he was invited as a guest on Ravenwood Radio. He had questing progress posts, important wizard information, and awesome contests. He also supported other many websites on his own website by adding links to each website to his Blogroll. Tom was by far the nicest fansite owner ever! Now there were and are many nice fansite owners, but he was the nicest if that's possible. Also the funniest! He has many great jokes in his posts. Yes, he's still blogging when he still can, which is awesome! Next year his website turns TEN YEARS OLD. That's a decade... how is that even possible?! I'm so glad he still decides to blog even after nearly a decade since creating his website for the game that we all know and love, Wizard101. I have many spelling grammatical errors on this website. If you read through some of my older posts, you'll see more of that. Tom made me feel welcome as a blogger even though I'm not really a writer! He made many other bloggers that have since left feel the same way. There are many wizards that come and go, but I want to thank Tom for making each and every blogger feel welcome. I love all of the old and current fansites, but this fansite is the best Wizard101 fansite. Thank you, Tom! I love blogging today and will continue to blog through Wizard101's lifetime thanks to you! Haha. Thank you for being who you are! Team Perfect Catch was a PvP Team: Kevin Battleblood, Fallon Deathslinger, Ronan Dawn, and Cassandra Dragonheart. I'm not much for PvP but this team made you want to try PvP out during the old Wizard101 days! This was closer to the 2011 timeframe, but this team definitely deserved to make it to this post of memories! Let's talk about the team members of Perfect Catch. Perfect Catch was an awesome PvP team that made you want to be an ice, storm, balance, and life PvPer. I remember back in the day, I started PvP because of how awesome this team was. I started pvping on my balance and eventually became a veteran (first generation, I think). I know today, there is a lot of people that don't do it for the fun, but at this time everyone was generally nice! I remember a stranger that I lost to telling me that I'd make it to warlord and to not give up. Perfect Catch was a reminder of how awesome PvP once was! I don't really care about the spells, only how people act now. It's a little crazy, but at the time PvP was fun to watch and try yourself. I remember watching Perfect Catch's matches every chance I got - which wasn't much, but I was lucky a few times! This team had great community leaders. They pvped for fun, and even made YouTube videos of it (there is one attached above that you can watch). Win or Lose, they won! I'm so glad we had such a great PvP team back then that was just awesome! I believe three members don't play the game anymore, and I'm sure they won't read this post, but they were great people! If you've been here awhile, I'm sure you agree with me even if you lost to their team. Thank you four for being such awesome people! Ditto Monster is an official Wizard101 Fansite owned by none other than Ditto. Ditto is such a great Wizard101 community leader. He's done so much for the community. I remember watching Ditto's first video in 2010. Ditto recorded his gameplay videos and even some event videos with Ravenwood Radio (such as running through Marleybone's Big Ben. Ditto has always been such a great community leader! We're extremely lucky to still have Ditto around making his questing videos. Ditto has also interviewed Kingsisle, for example, Fred Howard from Kingsisle, right before the release of Wintertusk. This was so awesome! I remember watching this video as soon as it was released! How could I remember a video from nearly 6 years ago? Well.. You know! I have a great memory, especially when it comes to Wizard101 related events. :D. I think Ditto has done such an amazing job bring everyone together to watch his videos, and now his streams. We're lucky to have him still streaming on Twitch and posting his videos on YouTube. Mrs Narrator, I'm not forgetting you! I want to thank you both for being such a positive impact in the community then and even today. I know you don't have to do this with all of the real-life situations that come along, but having you here even with that is amazing. Thank you. Paige Moonshade has made such a positive impact in the community with her housing posts, her guides, and her support of everyone in the community. Wizard Weekly was an amazing video series by Fawne from Wizard101 Central. This video series explored Wizard101 News, Houses and had letters from the Spiral where Fawne answered questions that wizards had on Wizard101 Central. Fawne did such an amazing job bringing the community together to watch Wizard Weekly each week. I mean as soon as you click play on the first episode above, you might even feel nostalgic. I know I do especially when I hear the opening.. I promise that's not ASMR-related. Wait, is it? No. Yes? LOL. No. Back to normal posting.. I'm glad Fawne made videos like this for the community. Life got busy for her, as it does for everyone, but it's always nice to go back and watch some of the Wizard Weekly videos when you want to feel nostalgic! Thank you so much, Fawne! You have no idea how much a positive impact you made for the community. I really hope one day you come back and make videos like that again! I don't know if it's likely, but Wizard101 Central needs to reach out to Fawne to see if she could come back and do a 2017 version. Of course, I want it to be like the 2011 version! :P You can enjoy this first episode of Wizard Weekly in 2011, from Fawne,by clicking on Play on the Video above! That's it for this post. Check back next time for another feel of the Wizard101 Olden Days! Until then, I'll see you around the Spiral. I remember all of these. How old were you when you starred playing this game? Thanks for sharing your memories of the early days of Wizzy. I remember the Dairy of a Wizard, Ravenwood Balls, being a mod oder Ravenwood Radio, after parties and MANY fun PVP matches with my teammates of TPC. I'm honored to be part of these memories Edward. Thanks for sparking my own wonderful memories of those times.